In LayOut, choose Window > Layers from the menu bar to open the Layers dialog box. 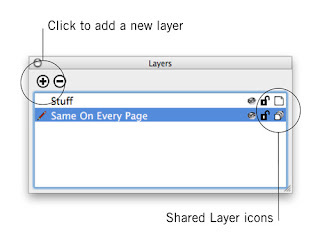 Create a new layer by clicking the "Add a new layer button at the top of the Layers dialog box. It looks like a little plus sign. Name your new layer "Multi-Page Elements" or "Same On Every Page", or something like that. Make your new layer a shared layer by clicking its "shared" icon. It looks like a little piece of paper, and it appears all the way to the right of the layer name in the Layers dialog box. When a layer is shared, its icon looks like a stack of pages. Be sure your new layer is active by clicking to select it (the selected layer has a little pencil icon next to its name) and create or add the element you'd like to appear on every page. Because the layer you're drawing on is now shared, anything on it will appear on all the pages in your document. Choose Window > Pages from the menu bar to open the Pages dialog box. 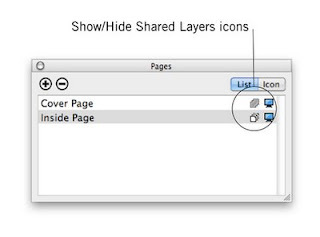 Click any page's "show/hide shared layers" icon (it looks like a little stack of papers) to set that page to show – or not show – elements which are on shared layers. When the icon looks "blacked out", that page won't show the contents of shared layers.